My sister eats salsa straight from the jar. For dinner. It's impressive, really. She doesn't even need tortilla chips whereas I must have a salty, crunchy vehicle for most condiments. 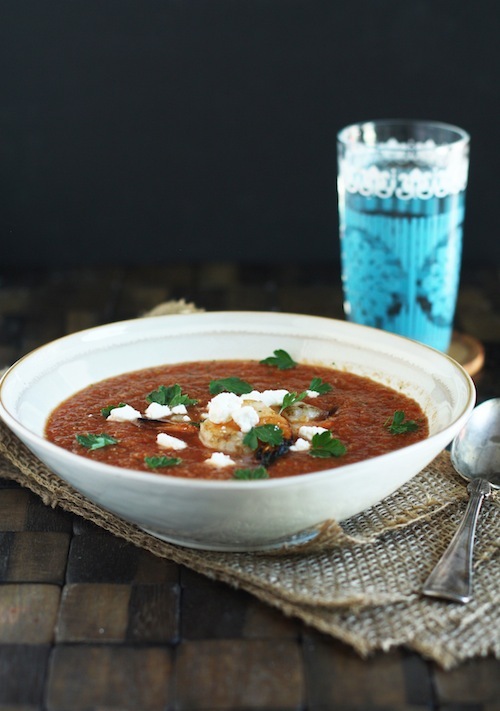 It's no surprise, given her love for salsa, that Rebecca has a fabulous gazpacho recipe under her belt. The first time I made gazpacho was using her recipe last summer. Before then, I had never really thought about this cold, vegetable packed soup. I had been missing out. Big time. Gazpacho is perfect for people like me who go crazy at farmers markets and end up with more produce than time to eat it. Yes, gazpacho is the answer for people like me. It's versatile, requires zero heat from the oven or stove (a priceless advantage when temps are in the upper 90's) and it is insanely healthy. The vegetables in the photo above are what I used to make my most recent batch, which deviates a bit from Rebecca's usual recipe but only slightly: orange bell peppers, baby cucumbers, a leek, and a can of San Marzano tomatoes because that's what we had on hand. This is a great recipe to have on hand for CSA folks too and is the perfect way to utilize the delicious, fresh tomatoes mid to late summer. I often hear from people wondering what to do with the plethora of vegetables they receive every week and this is a refreshing solution. Using Rebecca's recipe as a guide, I like to make variations based on what I have in my refrigerator. Even though I used canned tomatoes this time around, it is best with fresh. As if you needed another reason to try making gazpacho, keep in mind that it gets better as it sits. If you make it on Monday and have it for lunch throughout the week, it will just get better with each passing day. Did I mention that it takes less than 20 minutes to make? True story. My variation of Rebecca's recipe used a 24 oz. can of San Marzano tomatoes in place of the 3 large tomatoes and the tomato juice, orange bell peppers rather than red, and a leek in place of the onion. I also omitted the tomato juice and used the juice from the can of tomatoes. If you use canned tomatoes, you may still want to add a bit of tomato juice to thin out the gazpacho. Place them in the food processor and pulse a few times but don't completely purée yet. Add the tomato juice, vinegar, Sriracha, salt and pepper and purée until smooth. Serve cold topped with feta cheese, grilled shrimp, croutons, or nothing at all.